Snow Plowed Winter Ale is a full bodied brown colored ale with a distinct maltiness and an earthy hop balance. This beer has a warming character that makes it perfect for sipping on those dreary winter days. A traditional German style lager; amber in color; slightly sweet with a crisp hop bitterness. This beer is the celebrated style of the Munich Oktoberfest, the largest public festival in the world. A delicious golden nectar brewed with a hypnotic blend of wheat, honey, caramel malt, and various natural aromatics including orange peel and coriander. This annual ale is crisp, light, and refreshing. Hop Wang is our version of a double IPA brewed with fresh hop cones, grown and picked at Hophead Farms in Battle Creek, MI. The hop cones were picked the day before we brewed, giving this beer a remarkable fresh hop flavor. Jonesing for Java is an English-Style robust porter infused with a proprietary coffee blend developed and roasted at Fort Wayne's own Old Crown Coffee Roasters with the assistance of Mad Anthony's brewers. 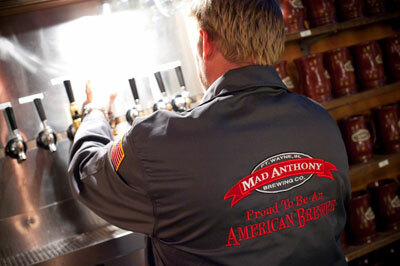 This MadBrew features a deep chocolate quality and satisfying earthy notes with a delicious coffee kick.